Sulfur buckwheat recovering after the Angora fire near Lake Tahoe. 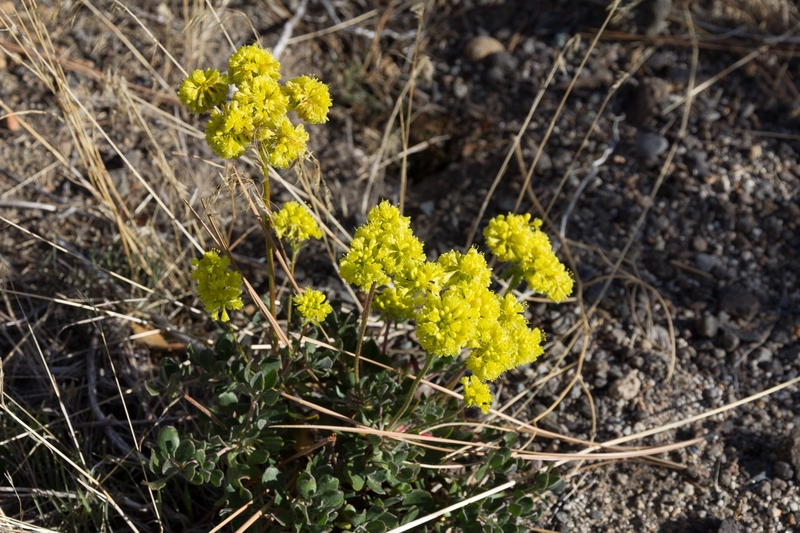 Eriogonum is the buckwheat genus, one of the largest in California, with over 125 species. With so many species to choose from, you are sure to find one for your garden! Native buckwheats come in both annual and perennial forms. 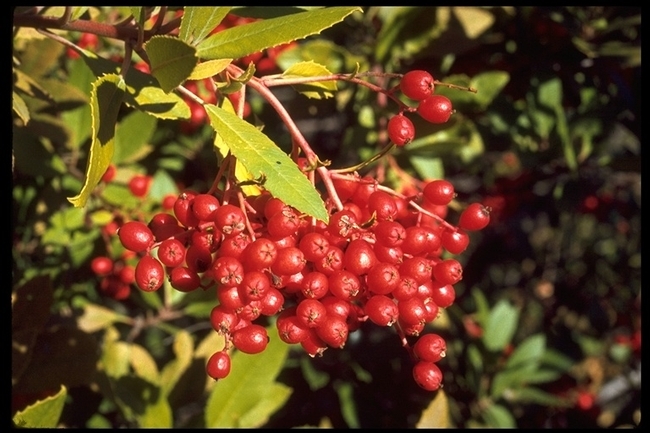 They are some of the most popular nectar sources for butterflies and beneficial insects. The flowers last a long time, turning a rusty orange or chocolate brown (depending on the species) when the seed heads develop in the fall, so they add interest to the garden in all seasons. Buckwheats are very drought tolerant and some species can even handle salt spray. St. Catherine's Lace, giant buckwheat. Photo: © Carol Nickbarg. All the buckwheats have dense terminal clusters of flowers at the tips of the branches, so what looks like a puffball from a distance is more like a tiny bouquet close up. 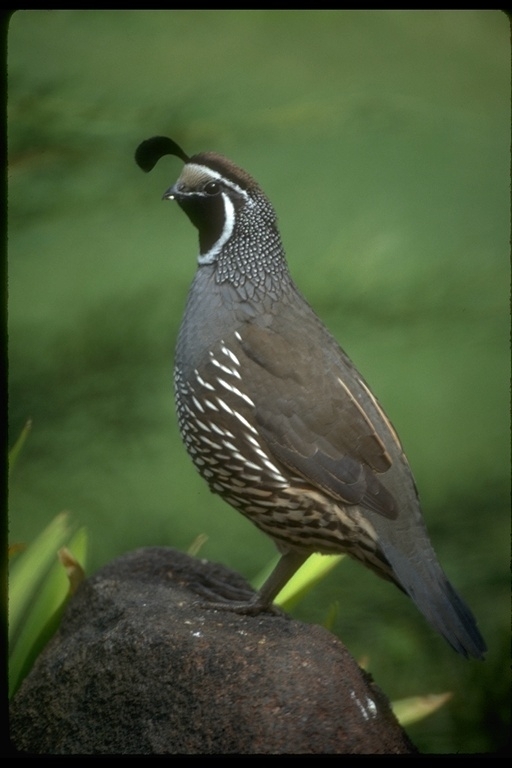 Most species are evergreen, only losing their leaves in the most severe drought conditions. Leaves are often hairy and light-colored, both adaptations to the warm, dry, Mediterranean climate where buckwheats are found. 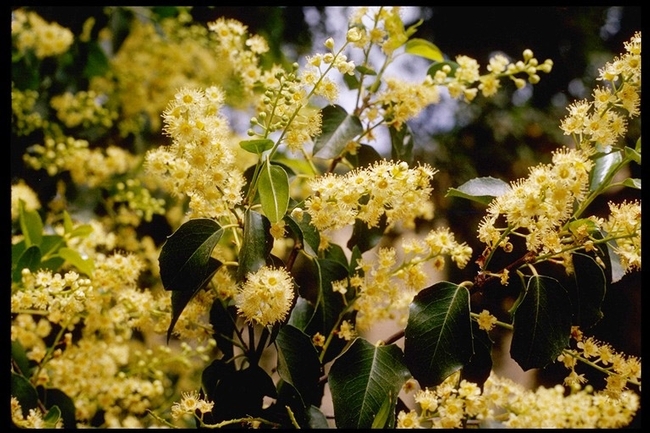 They grow well on slopes or in borders and bloom from late spring to early summer. 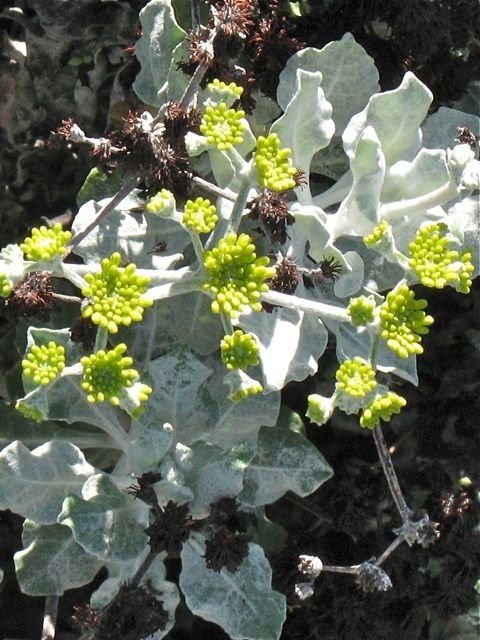 There are several species that grow locally, from the widespread shrubby California buckwheat (Eriogonum fasciculatum), to the grey-leaved coast buckwheat (Eriogonum latifolium), the delicate naked buckwheat (Eriogonum nudum) and the tiny-leaved sea cliff buckwheat (Eriogonum parvifolium) and the many subspecies within some of these species. 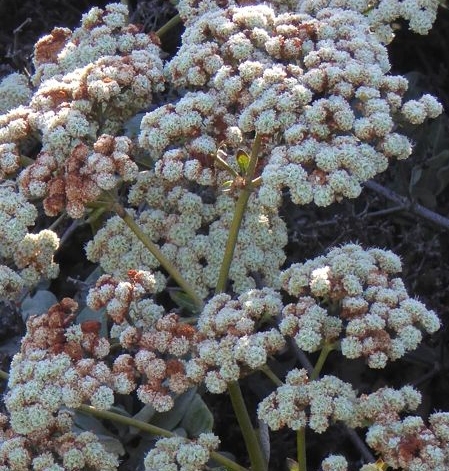 Other popular species for home gardens include red buckwheat (Eriogonum grande var. rubescens), which is native to the Channel Islands, sulfur buckwheat (Eriogonum umbellatum), with large yellow flowers, St. Catherine's Lace (Eriogonum giganteum), which forms a shrub of 3-6' tall and 6' wide and saffron buckwheat (Eriogonum crocatum), which is native to Ventura County but does well up here in the Monterey Bay area. Saffron buckwheat. Photo: © Carol Nickbarg. Native buckwheats give a huge bang for your native plant buck! 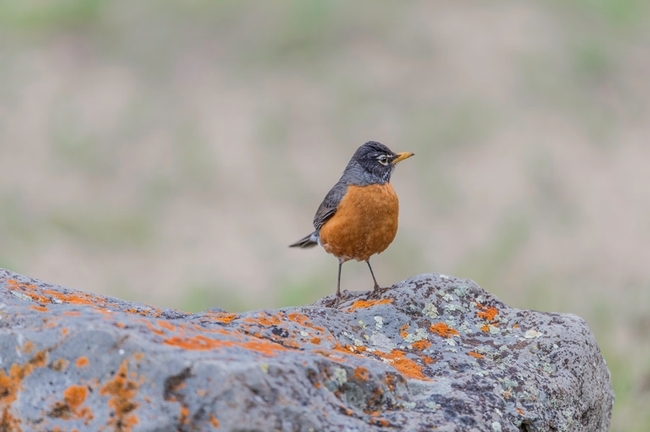 They're water-wise, good habitat for wildlife, and low maintenance. Now is the time -- if you've been thinking of experimenting with a native California plant, give buckwheat a try! In addition to native plant sales, you can find buckwheats at some of the local native plant nurseries. 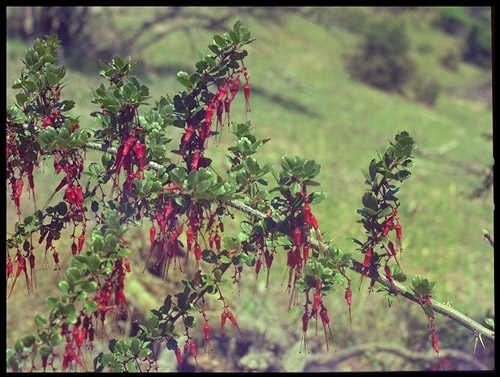 Check out the California Native Plant Society's search engine for where to buy. For more information on buckwheat, here are some good sources: pests, more information on different species of buckwheat, and their use in hedgerows. 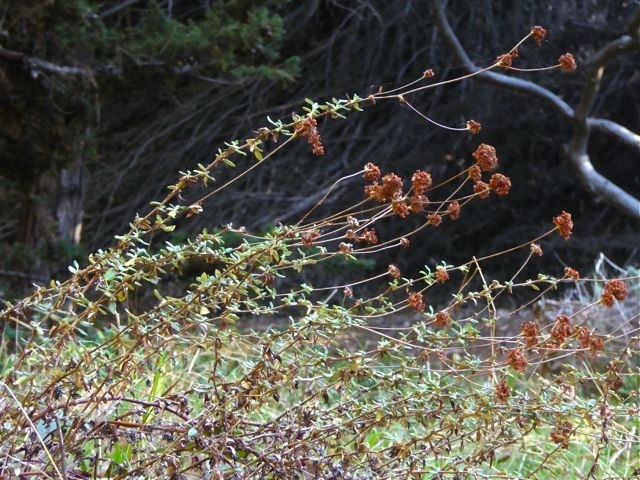 To see what buckwheat species are found in your area, visit the Calscape website. You can enter map coordinates or a street address to find a list of California plants that are native to your location. May the buckwheat be plentiful in your future garden! The browning flowers of sea cliff buckwheat. Photo: © Carol Nickbarg. 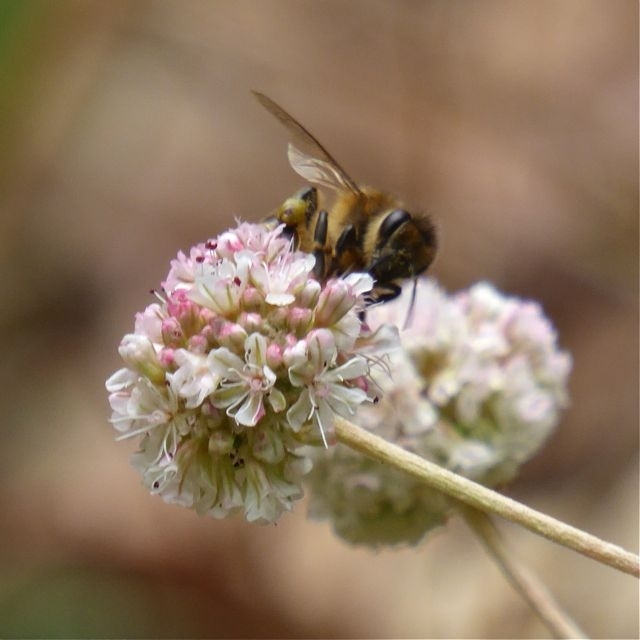 A honeybee feeding on sea cliff buckwheat. Photo: © Carol Nickbarg.